The chess game being played out in the South China Sea by China, Vietnam, the United States and other affected countries has wide implications as China's needs, power and economy expands. In today's closely connected world the challenge is to find a path that will not lead to conflict. So far the countries involved have been unable to harness China's need for expansion, and are headed for the shoals of an armed conflict that could reverberate around the world. The goal of the September 25th forum, Dangerous Waters, is to commence an ongoing discussion focused on this issue which will present various views and analyses, and, hopefully, practical paths toward accommodation and compromise which will avoid conflict and make the best use of limited resources for all. If this can be accomplished in the South China Sea, there is hope that other similar conflicts can be avoided as our world gets smaller and smaller and strains on its resources become greater. Bill Hayton's brief unpublished description of the contours of the conflict are presented here, for context. The essay accompanies the PowerPoint presentation, found here in PDF. Territorial Disputes in the Waters Near China, a detailed graphic with related articles from the New York Times. Keeping the South China Sea in Perspective, by Jeffrey Bader, Kenneth Lieberthal, and Michael McDevitt. A Brookings foreign policy brief outlining a recommended U.S. foreign policy stance in the conflict. Among other things, the U.S. should "lower the temperature of official public commentary"
China’s false memory syndrome, by Bill Hayton. Prospect Magazine, July 10th, 2014. The nationalist academics and government committees of the first half of the 20th century have bequeathed the Communist Party an “official history” that is demonstrably false. It is this, and not the threat of nationalist mobs on the streets that makes the South China Sea disputes so intractable and dangerous. But to concede its falsity would remove a cornerstone of the Party’s position at the apex of Chinese society. The text of the full article is here. 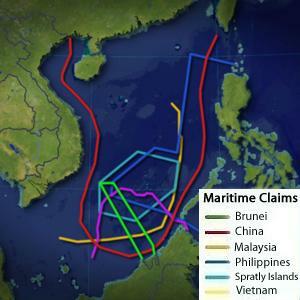 High Seas Drama: The South China Sea Disputes, by Mark J. Valencia. Global Asia Vol. 7, No. 3, Fall 2012. Featured essay. Separating Fact from Fiction in the South China Sea conundrum, by Mark J. Valencia. The Straights Times, September 19th, 2014. 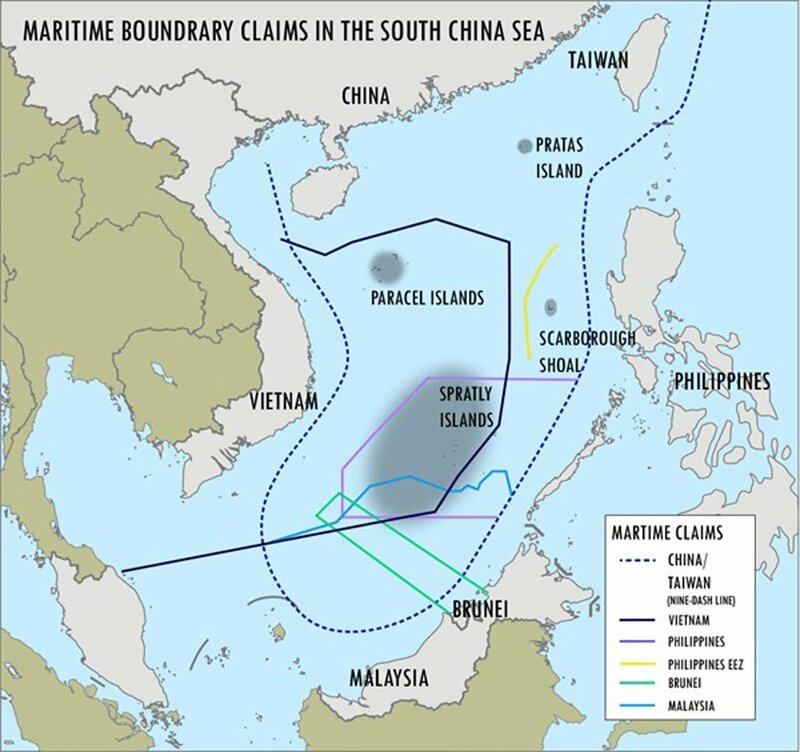 Mark Valencia takes several often-dropped phrases and statements about the South China Sea conflict and defines and analyses them for veracity. The "U.S. pivot" (from supporting China towards supporting other SE Asian nations), the idea of "ASEAN unity" in contrast to the facts of various nations' claims, and the regular reference to Chinese aggressiveness and "Chinese claims" (various competing legal claims exist and several countries have committed violations of stated Declarations of Conduct) are all covered.